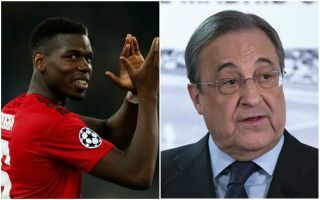 Real Madrid have reportedly been in touch with the entourage of Manchester United star Paul Pogba to discuss the date of his potential transfer to the Bernabeu. Barcelona are also being strongly linked with Pogba but Real Madrid want to get ahead of their rivals in the race for the France international’s signature. They will be unable to do this, however, until the summer as they won’t have the money to do a deal in January, according to Don Balon. The report explains that Pogba’s agent Mino Raiola is pulling all the strings to get his client out of Old Trafford, but a move to the Spanish capital will have to wait. Don Balon go on to say it is now down to the 25-year-old to decide when it is he is to leave United, with other options perhaps set to be available to him this winter. Either that, or Pogba can wait until next summer to have the chance of a move to Madrid, so it just depends how picky he is about where he plays next. After a difficult time in England it is little surprise to see ongoing claims that he and Raiola are plotting an escape. Pogba could also be a useful addition for Real as they look for a long-term replacement for Luka Modric in that creative midfield role.